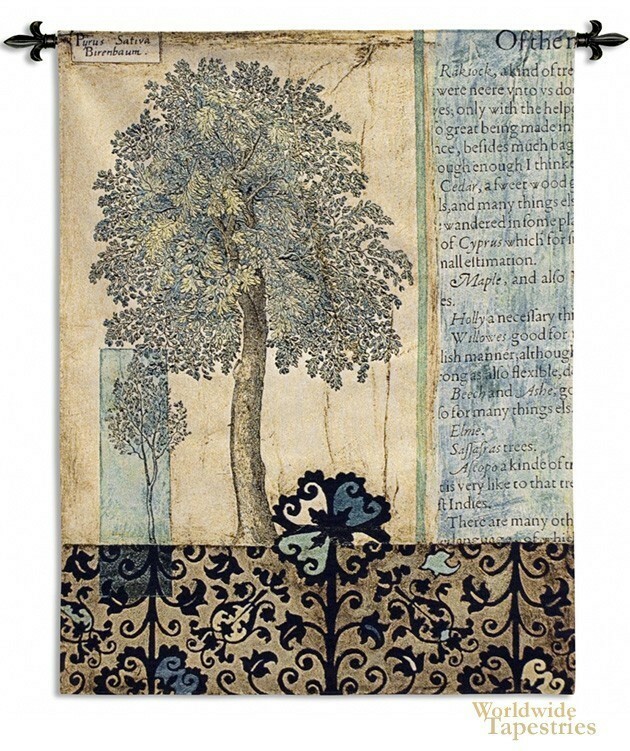 This wall hanging, "Blue Autumn" is a contemporary tapestry based on the work of artist Jennifer Goldberger. With elements of illustrative style, abstract layering of ideas and calligraphy, this tapestry is a tribute to the season of autumn and the change in morphology of the trees. The inscriptions on the right describe various deciduous trees found in Northern America and Canada. The illustrations display remarkable detail and intricacy which reflects the quality seen in botanical scientific illustrations. This contemporary tapestry "Blue Autumn" is backed with a lining and has a tunnel for easy hanging. Note: tapestry rod and tassels, where pictured, are purchased separately.